Cindy Smith lived in Uganda while her husband worked there, and they now reside in Utah, USA. 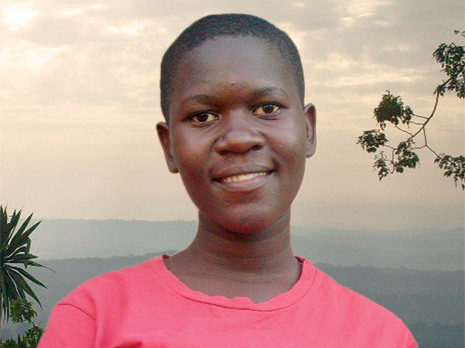 As they accept and live the gospel of Jesus Christ, youth in Uganda are seeing faith and hope grow all around them. In the heart of East Africa, the beautiful country of Uganda is blessed with rolling hills of sugar cane and banana trees﻿—and with young people ready to accept and live the gospel of Jesus Christ. The first stake in Uganda was organized in 2010. The Church is growing rapidly, with many young men and young women in each ward and branch. 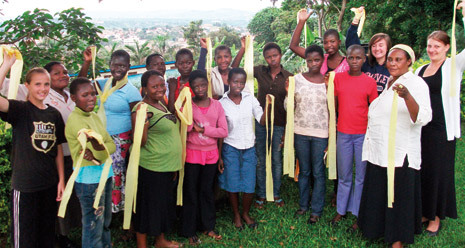 The young women in one ward were inspired by the teachings of Sister Elaine S. Dalton, Young Women general president, on virtue: “Now is the time for each of us to arise and unfurl a banner to the world calling for a return to virtue.”1 The young women hiked a hill overlooking the town and raised gold banners symbolizing their pledge to be examples of virtue. Together they sang “High on the Mountain Top” (Hymns, no. 5). These young women have raised their personal standards of righteousness. Their obedience has strengthened their testimonies and influenced others. Sister Dalton has said, “Never underestimate the power of your righteous influence.”2 And like a banner, the example of these young women waves to all the world. Sandra is the only Church member in her home, but her parents support her Church service, such as helping when the ward cleaned the grounds of a local orphanage. Her family sees how the gospel has helped her be strong, even when facing unresolved problems. Reflecting on the source of that strength, Sandra says, “When I go to church, I feel like I am putting on the armor of God” (see Ephesians 6:11–17). A more recent convert, Susan, loves the Church. Originally from South Sudan, her family fled hardships and was blessed to receive the missionaries in Uganda. As a refugee, she found peace and protection in the gospel. On Sundays she would bring her younger siblings to church, as well as up to 10 other children who are not Church members. After the unexpected death of a family member, she returned to South Sudan, where she waits for the Church to be established in her area. Both Susan and Sandra face challenges, but they rely on God and enjoy the fruits of living the gospel of Jesus Christ (see Alma 32:6–8, 43). 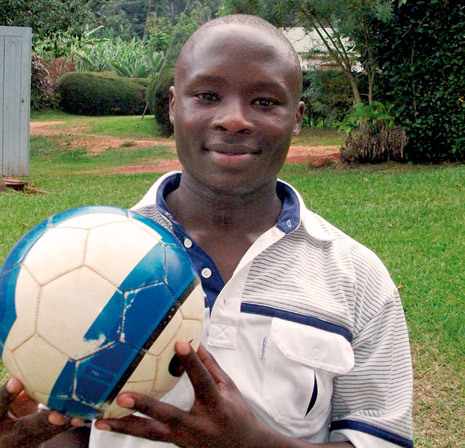 Young men in Uganda start playing football as small boys, using tightly bound branches for a ball. Ever since he was very young, Dennis had a gift for the sport, and his high school gave him a scholarship to play for their team. After he completed high school, a professional team offered him pay, room, and board. It was a dream come true, but Dennis knew this would likely interfere with his plans to go on a mission later in the year. In Dennis’s ward the young men study Preach My Gospel each week. They have become like a team, working closely with the full-time missionaries and bringing friends to Sunday meetings and other activities, including basketball and football games during the week. The priests have baptized friends and others they helped teach with the missionaries. Over several years, this team of young men has strengthened the whole ward, and four of them, including Dennis, received calls to the Kenya Nairobi Mission. They have followed the counsel of Elder David A. Bednar of the Quorum of the Twelve Apostles to “become missionaries long before you submit your mission papers.”3 They did so by working together as a quorum, a team better than any other. The youth of Uganda are helping build God’s kingdom here, with great hope for the future. Although there is no temple in East Africa, the youth look forward to the time when they will marry in a distant temple. One stake activity focused on preparing to enter the temple, and at the conclusion, a member of the stake presidency bore his testimony: “God loves you. You are the future of the Church in Uganda.” These righteous youth are already having a great influence. The young men and women of Uganda are sacrificing the things of the world for blessings that will last forever. They have planted the seed of faith and are nourishing it with care (see Alma 32:33–37). Like a tree filled with fruit (see Alma 32:42), the youth share the joy of the gospel in this fertile land. Elaine S. Dalton, “A Return to Virtue,” Liahona and Ensign, Nov. 2008, 80. Elaine S. Dalton, Liahona and Ensign, Nov. 2008, 80. David A. Bednar, “Becoming a Missionary,” Liahona and Ensign, Nov. 2005, 45. Top: Youth attend a stake fireside together. Above: Susan (center), a refugee in Uganda, found peace in the gospel and brought her siblings and other children to church. Center: The young women of this ward enjoy working on Personal Progress. Right: Dennis gave up a spot on a professional football team to preach the gospel. He and the other young men in his priests quorum sacrificed and overcame challenges to serve missions.